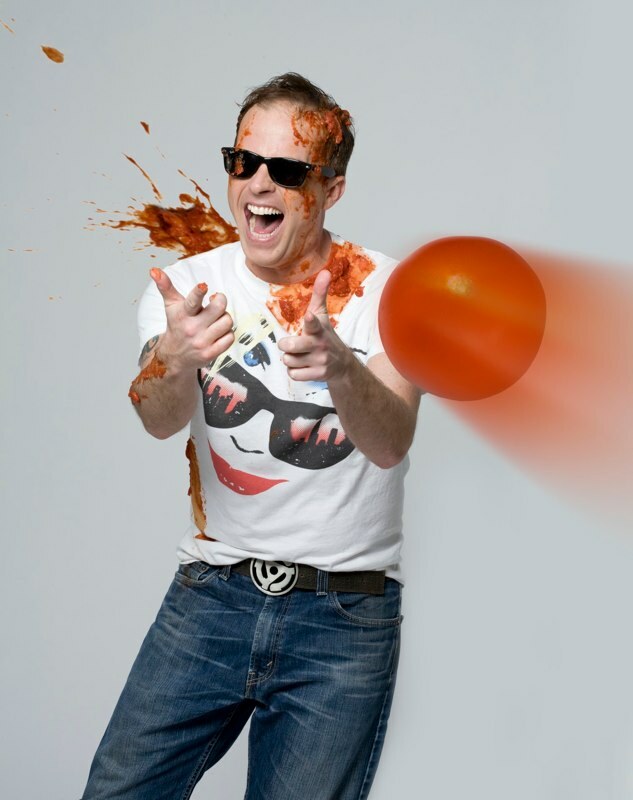 Peter Michael Marino (and glasses and tomatoes). Photo by David Rodgers. Human stories of excitement, creation, disillusion, depression, and redemption make for great storytelling and can make fabulous theatre. In the basement performance space at the Triple Crown Restaurant & Ale House in lower Manhattan for the next few weeks (and after that other U.S. cities then travel to the UK), you can participate in the development of a performance piece built out of creative impulses, some big league adventures in theatre making (big names, big money, big stakes) with a big payoff: you like this guy and can feel his story with him. And once Marino has all his story transitions under his belt (cards came out this first press performance and the audience stayed with him — he’s a stand up improv pro, it is perfectly clear, and theatrical moments were made out of every pause), this one man show riffing on a ganja-inspired idea to merge Blondie and Madonna into a stage adventure will truly succeed. So Marino loves the 1985 movie Desperately Seeking Susan (starring Rosanna Arquette and Madonna) and Marino loves Blondie and in his mind they morph together during a creative “bong hit” inspirational moment in 2005 or so. He proceeds for the next few years, through fortuitous timing and meetings, to workshop that idea in various cities. All this activity culminates in a full production commitment in London a few years later. He is paired with a young director who loves the movie and doesn’t know from musicals, paired with a choreographer who seems to be from another planet, told to stay out of the rehearsal room, and experiences American English – British English misunderstandings throughout the experience. There is fodder here for fun and pain and understanding gasps, sigh, and applause and all these are abundant in my American audience of Baby Boomers. A sequence in which Marino recites word for word many of the scathing London reviews, one of which inspires the title of this show, illustrates something important about how nasty reviews take hold in an artist’s memory, and should underscore for the serious critic not to be flippant with their analyses. Basic knowledge of the plot of the movie Desperately Seeking Susan is helpful to many of the jokes in this show — materials or projections or cartoons based on the story line might be useful as this show moves forward. Similarly, for those of us who aren’t terribly familiar with the Blondie music that forms an essential part of the musical-in-the-making in this play’s story, some of that as house music (original versions or the tunes as covered by others), might help inform or enhance the experience of future audiences. All that said, as someone who doesn’t know Blondie’s music terribly well but who knows the movie, who is familiar with the inside of a rehearsal room and the joys and pains of theatre projects in development, this piece already speaks to me. Marino’s charm as a performer and his complete honestly about his (and everyone else’s) actions throughout the theatre-making adventure are entrancing.